China’s Ambassador Cheng Xueyuan during a meeting with Prime Minister Ranil Wickeremesinghe yesterday has assured the Chinese Government had approved the $1.1 billion loan for the construction of the first phase of the Central Expressway, the Prime Minister’s Office said. The statement was issued following reports that loan disbursement had been held up, despite the expressway being in the works for the better part of two years and being one of the flagship projects of this Government. The loan was obtained from the China Exim Bank. 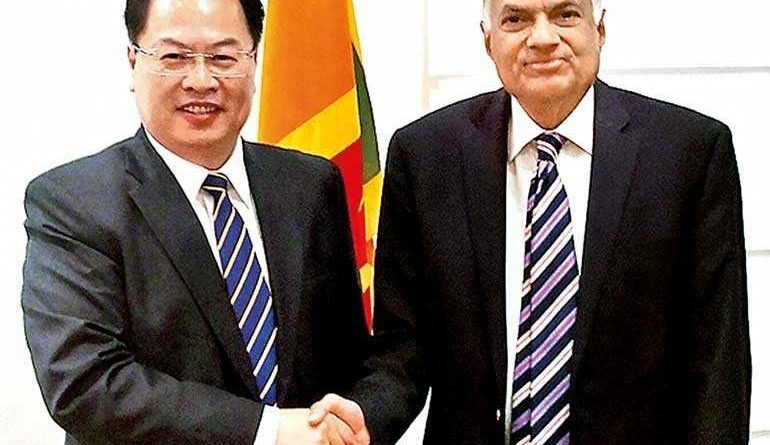 “The Chinese Ambassador to Sri Lanka met Prime Minister Ranil Wickeremesinghe to break the good news of the Chinese Government approving $1 billion for phase I of the Central Expressway construction. Instructions have been given to Chinese EXIM Bank to process the loan. The Ambassador requested that the Sri Lankan side expedite administrative and legal formalities,” the statement released by the Prime Minister’s Office said. The first part of the Central Expressway project from Kadawatha to Mirigama – a stretch of 37.09 km – had been delayed due to lack of funds, prompting the Road Development Authority (RDA) to call on the Government to intervene in securing loan disbursements, reports over the weekend said. RDA officials had also raised concerns that unless the funds were obtained speedily, the expressway may not be able to meet its 2020 completion deadline. Ambassador Cheng had also discussed the Hambantota port and investment zone, as well as the Colombo Port City project, the statement added. Both ventures are expected to bring in significant revenues of Foreign Direct Investment (FDI). The progress of Chinese-funded water projects was also discussed. Earlier this year, the Government outlined plans to present new laws to Parliament, regulating the proposed international financial centre to be set up as part of the Port City project. The Government last year also approved a $1 billion project to construct the facilities for the financial centre, which was given to the company building the Port City. The last tranche for the payment of Hambantota port is due on 9 June, which would enhance the foreign reserves of the country, the statement said. ← Say ‘Sorry’, stay happy!